Our Garmin Approach S60 review asks the question; how smart is this smartwatch? The new Garmin Approach S60 is stunning! Full review coming soon. The Garmin Approach S60 is a golf GPS first, smartwatch second. And that’s how it should be. It seamlessly combines its golf functions and required lifestyle accessories, all in a stunning package. We tested the Garmin S60 at the Shire London, and Archerfield Links. Sleek, slim and chic. While some smart watches can be clunky and cumbersome, the Approach S60 oozes class and sophistication. No one is going to know this is primarily a golf watch - which is a good thing. We'd happily wear it as a standard watch. How the Approach S60 performs on the course is the most important aspect to us. Thankfully, we enjoyed the simple, distilled golf app, which gave us ample information while traversing the links. It can take a little while to find GPS, so make sure you start doing this before you’re on the first tee. It comes with over 40,000 courses pre-loaded, and you can download new tracks if need be. The watch shows you front middle and back, and we found the yardages to be spot on when we tested it up against a laser rangefinder. It also provides a “plays like” feature, which is useful when tackling new courses, although cannot be used in competition. Once again, this was relatively accurate, but players must also be aware it does not take into account other variables, such as wind. While playing, two taps on the map allows you to see exact yardages to any point on the hole, and a more detailed view of the green. You can drag the pin to the exact flag position on the green, and the watch even shows you the direction of the flag when you have a blind shot. Keeping score is simple, and the watch also shows how many steps you have taken, the time it took to play, and the exact distance covered. The colour display looks excellent on the 1.2 inch sunlight touchscreen, which itself is a revelation as it allows users to swipe around with ease, picking up every tap and swivel. 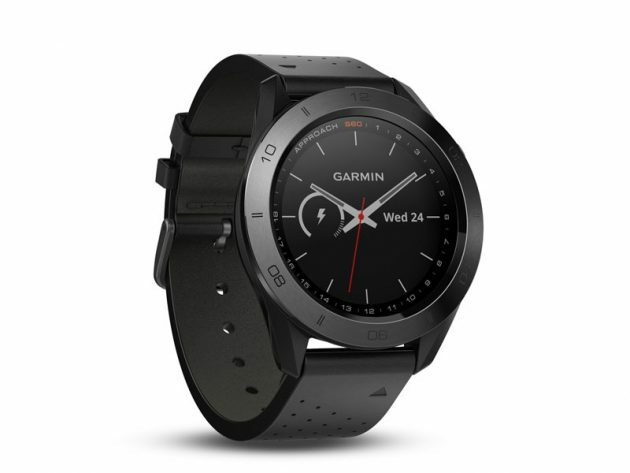 Once you have finished the round, players can sync the watch with the Garmin Connect app, allowing them to see how they played each hole via an aerial view, and also yardages of shots from the tee and fairway. It does miss a couple of chips close to the green, and does not track putts which is a shame. Those of you that want to know how your short game is performing will go wanting. And for those of you with a competitive spirit, the watch allows you to take on other golfers in the app, with weekly leaderboards or private tournaments, all of which have a live option. There are two training apps; one measures swing tempo, while the other looks at plane, but requires you to buy an accessory for £129.99. They are appealing additions, and work well. The watch syncs with your phone, allowing you to control alerts such as calls, texts and emails and it syncs with apps and calendars. You can put the phone to vibrate, or leave it on silent - this way, you do not need to keep looking at your phone on the course as you play. There are also a host of other features, such as a step counter, calorie counter, run, walk and swing trackers, which show you how far you have moved and at what pace. Garmin have utilised their expertise in fitness technology and loaded it into this product. Unfortunately there is no heart rate monitor, which comes with other Garmin fitness watches. There’s also a load of customisation options, in the form of watch faces, widgets and apps, allowing you to build a watch to your liking. The battery lasts for 10 days when in the “watch mode” or 10 hours when golfing which should comfortably get you through a couple rounds! It is also quick to charge, which is a big plus, taking roughly 45 minutes to go from 0-100%. The best golf smartwatch we’ve tested. Looks superb, simple to use, and provides accurate data. There’s plenty of information provided both on course and when you want to look at your round in the app after playing. The touchscreen works excellently, allowing for a great user experience. There’s a host of other fitness features to get to grips with, and it also allows for lots of personalisation. A premium product in the golf GPS category, which is reflected in the price, but one that we think will have great appeal in 2017. Head to the Garmin website for more information.